It was the best of times, it was the worst of times, it was the age of yoga studios, it was the age of kombucha, it was the epoch of composting, it was the epoch of GMOs, it was the season of avocados, it was the season of star fruit, it was the spring of hope, it was the winter of despair, and so on and so forth. In the last year and a half, two remarkably different sushi joints have taken up residence precisely 427 feet away from each other near the intersections of Haiku and Kokomo Roads. Should you find yourself in Haiku with a hankering for raw fish and standing precisely at the 213.5 foot mark, here’s what’s up. 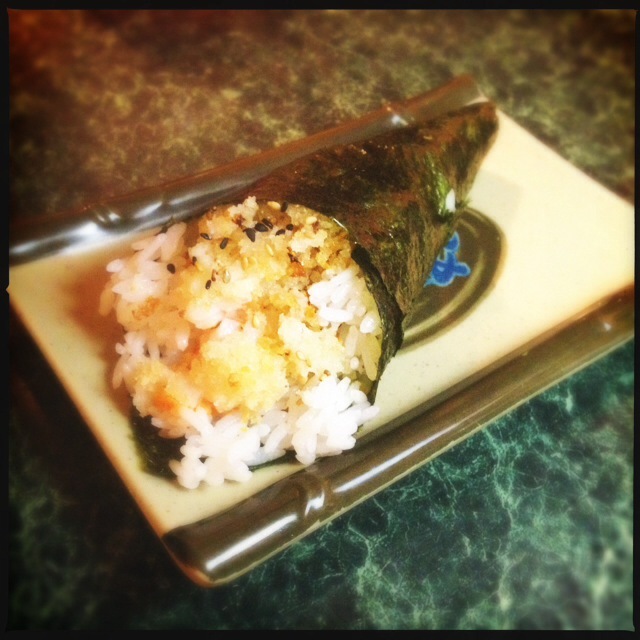 There’s Nuka, and then there’s Wayne’s Sushi. Nuka, brought to you by the folks behind the Paia Fish Market, boasts sushi chef Hiro Takanashi. It opened in late March of this year in a location previously occupied by a car parts store. The makeover is stunning. The space is at once clean and modern, yet inviting. Whoever designed it deserves a key to the city/town. 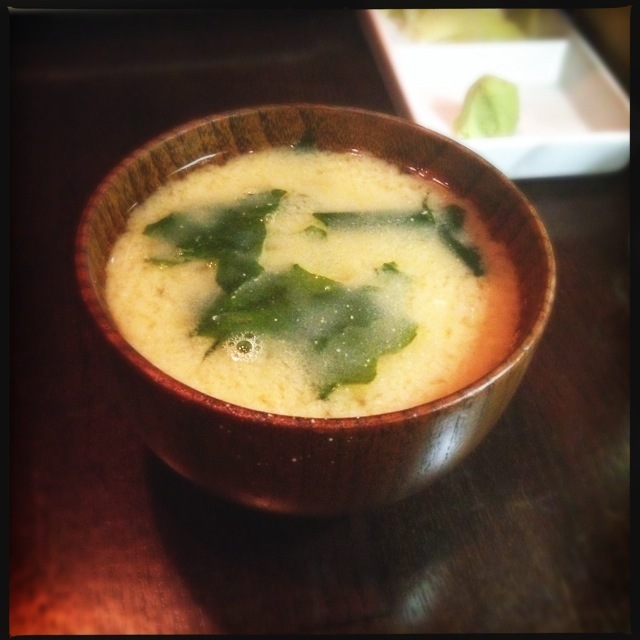 We started with the Miso Soup ($3). A simple item easily botched, the Nuka version is excellent. 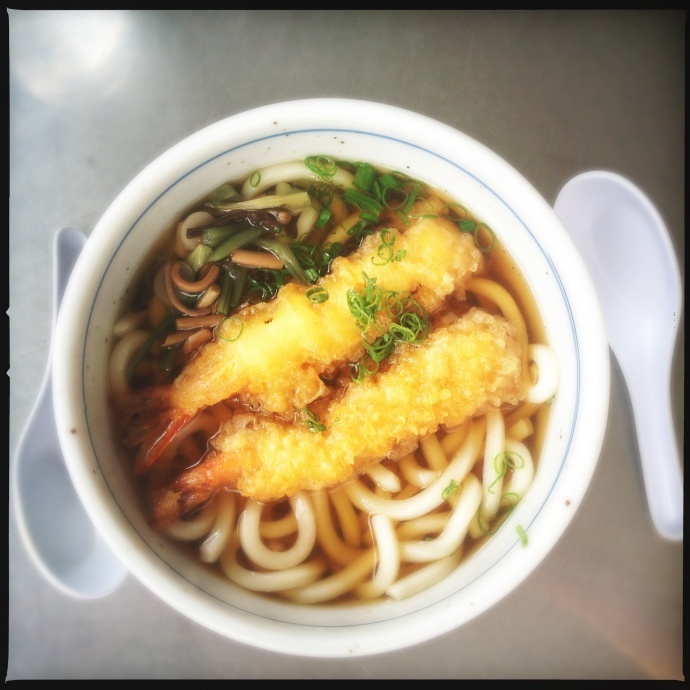 The miso is clearly very high quality and avoids the usual overdone soy/sodium trap. 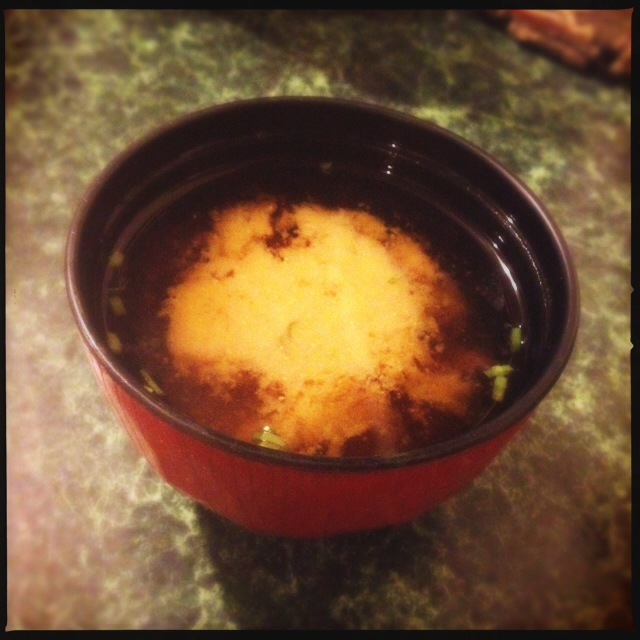 Small tofu cubes and huge flakes of seaweed add depth to the rich, yet subtle broth. 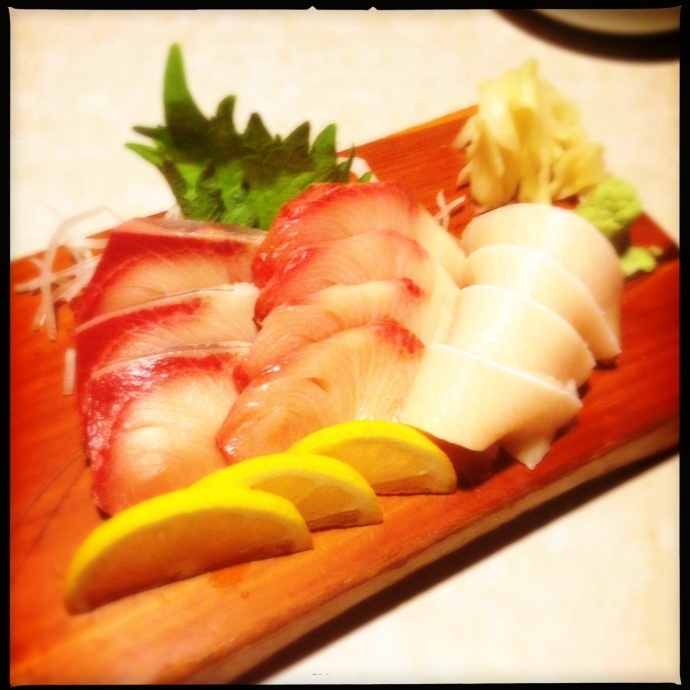 Hamachi Carpaccio ($17) is the dish that Nobu Matsuhisa (of Nobu. There’s one on Lanai if you want to try the original) made famous. 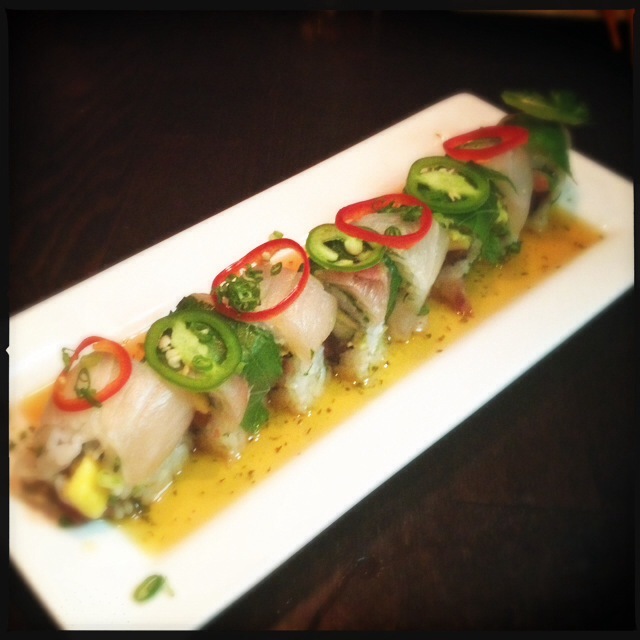 Six pieces of yellowtail are topped with thin slices of red and green jalapenos and a tidal wave of ponzu. Copious cucumbers surround the fish, but why? Only the green jalapenos had any heat, and we realized too late we’d have been happier with the sashimi. 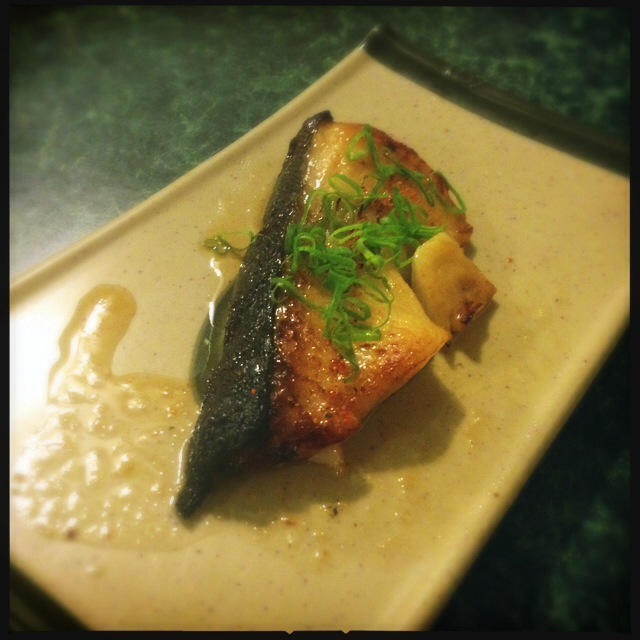 The Miso Butterfish ($18) is a simple, smallish, but glorious piece of cod that makes us bust out in alliteration: flaky, flavorful, fresh and flat-out fab. We were more than content until our neighbors – seeming repeat customers – received two pieces in their bowls. It looked like a lot more than our portion, but maybe we were wrong about that estimation. We’re down with showing the regulars some love, but fish envy sure makes digestion difficult. The Nuka Roll ($16) maybe shouldn’t be the flagship item. “Taste the Rainbow” was not a thought we had. 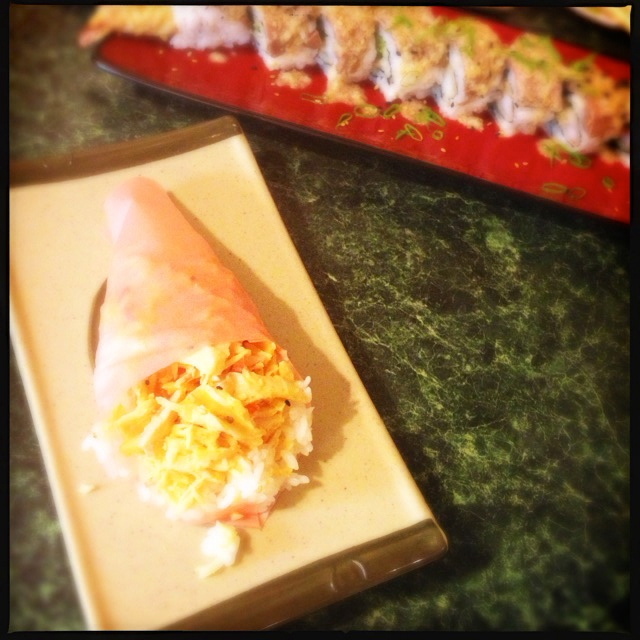 Despite being made with spicy tuna, jalapeno and shiso leaves, the roll was surprisingly bland. On the upside, it was well balanced blandness; like a nice, neutral shade of beige. In contrast, the Haleakala Roll ($19) is a must-have. This baked California roll is topped with salmon and bonito flakes, resulting in a brand new taste sensation from a familiar favorite. Again, the restaurant is gorgeous, as are the waitresses. Service is cool but efficient, and the place gets busy. They don’t take reservations, so get there early or expect to wait. 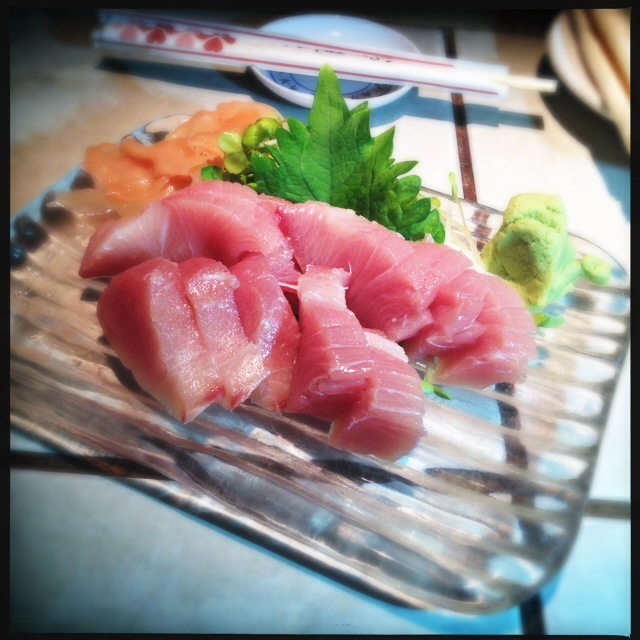 Right around the corner, Wayne’s Sushi couldn’t be more different. Chef and owner Wayne is helped out by fellow sushi chef and son, Jesse. A little googling indicates Wayne relocated this restaurant from Sahara Avenue in Las Vegas. Wayne himself is a culinary Salvador Dali. The menu is on the bleeding edge. Not everything works, but we admire him going for it. The space is homey and homely: reminiscent of any number of family-run joints on the island. You seat yourself and wait for the approach. Attempting to compare apples to apples, we ordered the Miso Soup ($2). 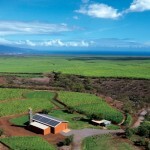 It’s lava hot and otherwise typical – i.e. too salty. There was only a hint of seaweed and no tofu in our bowl. Pass. 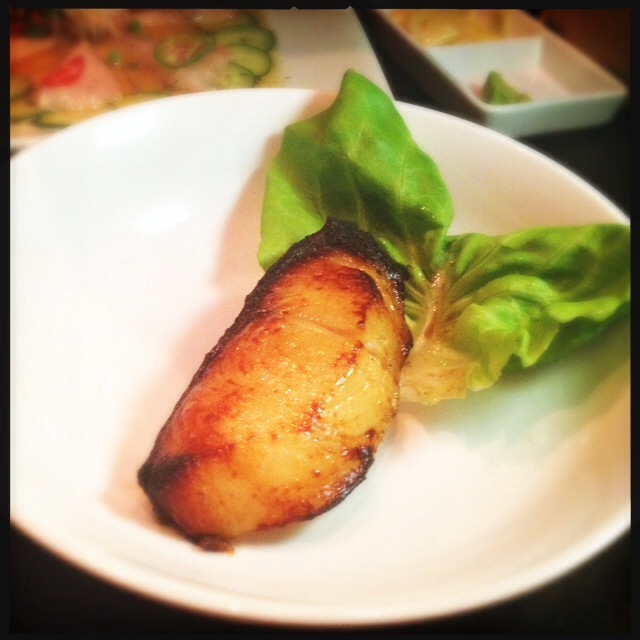 Wayne’s also offers Miso Butterfish ($8). Although well prepared, the fish was extra oily, as though supplementary fat had been added. The price is lower than Nuka’s, but the portion sizes make the two offerings fairly equivalent. We prefer the former. 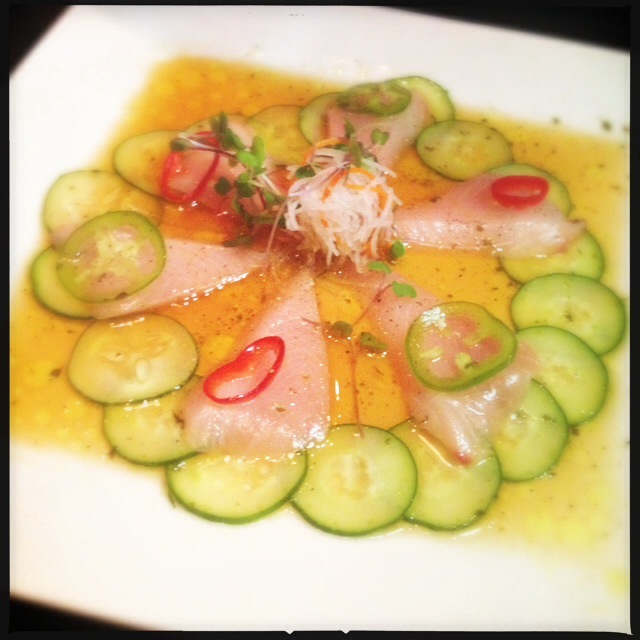 The Hamachi Jalapeno Sashimi ($16) is like the one next door/Nobu with the addition of a little dab of Sriracha. Wayne gave us a generous eight slices, but again, if you actually want to taste the fish just stick with regular sashimi. The food is delivered willy-nilly. Let go of your preconceived notions about proper sequencing. The Crispy Critter Roll ($9) is a solid choice even though krabb billed as crab makes us sad. Wonderfully fresh and tender fresh shrimp tempura made it all better. 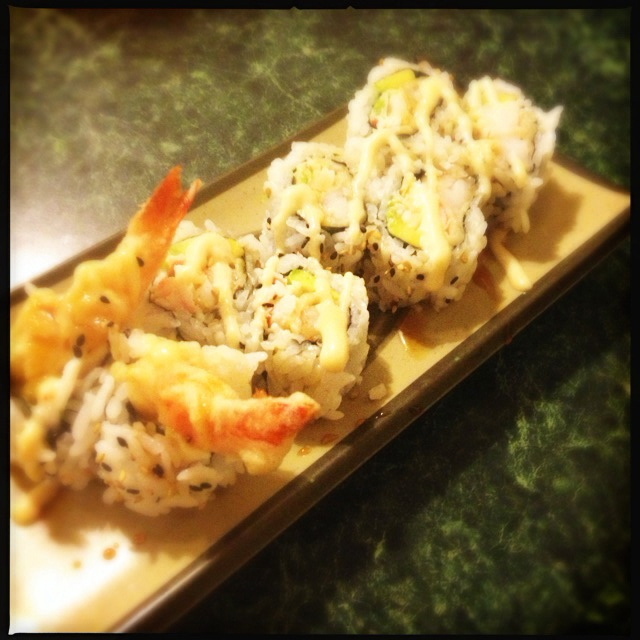 The Avocado Roll ($4) was perfect. Simple and clean, it’s a slam-dunk. All told, however, Wayne’s psychedelic sushi is where it’s at. For about two years in middle school, we spent our lunch money on nothing but Blue Bunny Strawberry Sundae Crunch Bars. We have no idea how this is possible – signs point to Li Hing Mui – but the flavor of the Baked Garlic Shrimp Hand Roll ($7) at Wayne’s is a dead ringer for that frozen confection. It’s pretty freaky, but dip it in some soy sauce to balance the cloying sweetness and we could get used to this. The Mango A Go Go Hand Roll ($7) really should indicate it’s spicy krabb. Pulverized white fish with a layer of red food coloring aside, this thing was a disaster. The waitress apologized for the melting mess as she dropped it off. Wrapped in damp sherbet pink-colored “soy paper,” it’s a gimmick that fails. In contrast, the What Brah, Beef? Roll ($14) is a novelty that works: a shrimp tempura and asparagus roll is topped with beef and a sweet ginger pepper sauce. 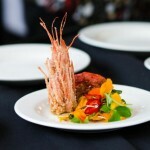 Wayne’s time in Vegas shows in his culinary gambles, and this time he rolled a hard ten. Glamorous showgirl versus avant-garde street magician. Perhaps the best bet is to sample the highlights of each. Nuka can be found at 780 Haiku Road and is open Tuesday through Sunday from 4:30 to 10 p.m.
Wayne’s Sushi is located at 824 Kokomo Road and is open Tuesday through Sunday from 5 to 10 p.m.